Set off the street and on acres of landscaped gardens, Quest East St Kilda is quiet and secluded and caters for both the business and leisure traveler. 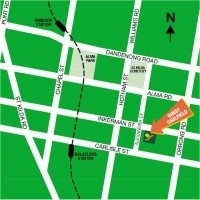 Ideally located just seven kilometers from the CBD, Quest East St Kilda is close to public transport and the cosmopolitan shops and restaurants of Carlisle and Chapel Streets. We offer a choice of suites, spa suites, and one bedroom apartments together with two and three bedroom townhouses. Our standard suites are beautifully appointed and offer FOXTEL, high speed internet together with tea/coffee making facilities. Our popular spa suites feature a full marble bathroom with corner spa bath and our 1 bedroom apartments have a fully equipped kitchen with a separate bedroom, dining and living area. All rooms offer abundant natural light and outside area with most rooms opening onto a courtyard or private balcony. Each Townhouse is fully equipped with a modern kitchen and full laundry facilities together with a separate lounge and dinning area allowing guests to relax in space, comfort and privacy. The ensuite bathrooms are beautifully appointed with full marble and large spa baths. Each Townhouse has a private backyard and car park. All guests have access to our fantastic indoor heated pool & spa, and given the property is set well off the road, all of the rooms at Quest East St Kilda are quiet and secluded. Continental breakfast baskets are available at reception and let us do the shopping for you by making use of our convenient pantry shopping service. Our 1 Bedroom Apartments are completely furbished and include a fully equipped kitchen, and separate living and bedroom areas. In addition, the apartments feature 5 channels of FOXTEL cable TV, wireless high speed internet access, reverse cycle air conditioning, and ample cupboard and storage space. All rooms offer an abundance of natural light and open onto an outside area, usually a courtyard or private balcony. We can accomodate up to 4 guests. Complete with an enormous living room, fully equipped kitchen with dining area, and full laundry facilities, our 2 Bedroom Townhouses offer space and comfort. Downstairs you find the kitchen and dining area, enormous living room, laundry and toilet. Upstairs are two bedrooms the master bedroom with Queen Size bed and a luxurious marble bathroom with corner spa the 2nd bedroom with 2 Single size beds. Complete with an enormous living room, fully equipped kitchen with dining area, and full laundry facilities, our 3 Bedroom Townhouses offer space and comfort. Downstairs you find the kitchen and dining area, enormous living room, laundry and toilet. Upstairs are three bedrooms the master bedroom with Queen Size bed and a luxurious marble bathroom with corner spa the 2nd & 3rd bedrooms each with 2 Single size beds. There is also a 2nd bathroom and separate toilet. Our Executive Spa suites offer guests luxury at an affordable price! Enjoy your stay in a spacious hotel style room featuring a large corner spa set in a marble bathroom. All rooms have reverse cycle air conditioning and room access to an outside area, usually a landscaped courtyard. With a Queen size bed, 5 channels of FOXTEL cable TV, executive desk, tea & coffee making facilities, refrigerator and ample cupboard and storage space, the suites are perfect for 2 guests. For larger groups, roll-away beds are available for one additional guest (extra cost), as well as interconnectiong suites. Our Standard Suites are beautifully appointed hotel style rooms and offer a Queen size bed, 5 channels of FOXTEL cable TV, high speed internet services, tea & coffee making facilities, refrigerator, and ample cupboard and storage space. All rooms feature reverse cycle air conditioning and open onto an outside area, usually a courtyard or private balcony. The suites are perfect for 2 guests, with the option of 1 extra guest (additional cost), and interconnecting suites are available for larger groups. All rates are based on 2 guests. Each additional guest is charged at $25 per night. Ideally located just seven kilometers from the CBD, Quest East St Kilda is close to public transport and the cosmopolitan shops and restaurants of Chapel and Carlisle Streets. Close to Caulfield Racecourse, Monash University , Rippon Lea Estate and Caulfield Grammar School , the property is set on acres of lush landscaped gardens. The property is set off the street and is quiet and secluded.